About 90,000 people in the U.S., mostly blacks, have sickle cell, the first disease for which a molecular cause was found. Worldwide, about 275,000 babies are born with it each year. "Vexing questions of race and stigma have shadowed the history of its medical treatment," including a time when blacks who carry the bad gene were urged not to have children, spurring accusations of genocide, Keith Wailoo of Princeton University wrote in a separate article in the journal. The disease is caused by a single typo in the DNA alphabet of the gene for hemoglobin, the stuff in red blood cells that carries oxygen. When it's defective, the cells sickle into a crescent shape, clogging tiny blood vessels and causing bouts of extreme pain and sometimes more serious problems such as strokes and organ damage. It keeps many people from playing sports and enjoying other activities of normal life. A stem cell transplant from a blood-matched sibling is a potential cure, but in the U.S., fewer than one in five people have a donor like that. Pain crises are treated with blood transfusions and drugs, but they're a temporary fix. Gene therapy offers hope of a lasting one. The boy, now 15, was treated at Necker Children's Hospital in Paris in October 2014. Researchers gave him a gene, taken up by his blood stem cells, to help prevent the sickling. Now, about half of his red blood cells have normal hemoglobin; he has not needed a transfusion since three months after his treatment and is off all medicines. "It's not a cure but it doesn't matter," because the disease is effectively dodged, said Philippe Leboulch, who helped invent the therapy and helped found Bluebird Bio in Cambridge, Massachusetts, the company that treated the boy. The work was supported by a grant from the French government's research agency. Bluebird has treated at least six others in the U.S. and France. Full results have not been reported, but the gene therapy has not taken hold as well in some of them as it did in the French teen. Researchers think they know why and are adjusting methods to try to do better. 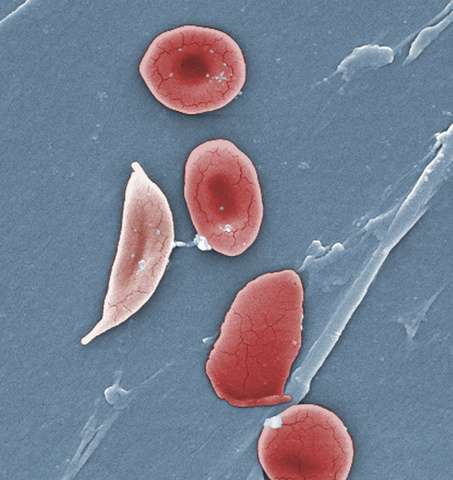 Two other gene therapy studies for sickle cell are underway in the U.S.—at the University of California, Los Angeles and Cincinnati Children's Hospital—and another is about to start at Harvard and Boston Children's Hospital using a little different approach. "This work gives considerable promise" for a solution to a very common problem, said Dr. Stuart Orkin, a Boston Children's Hospital doctor who is an inventor on a patent related to gene editing. "The results are quite good in this patient," he said of the French teen. "It shows gene therapy is on the right track."